A community member shared several prices for kidney stone treatment via our site. I asked him what was up, and we started a conversation. This is what resulted. Let’s call him Michael from the Louisville, Ky., area. Before we start, though, I want to note that a system requiring someone like Michael to go to these lengths while he’s worrying about a serious health problem is unusual throughout the developed world. It’s pretty much only here in the United States that he would have to do this. We plan to follow his journey, so check back for updates. I am self-employed and my choice was down to paying for insurance or doctor bills. So I chose to forgo insurance to make sure I could afford to see my doctors. Since that decision was made, I have had a bout of kidney stones (4 separate stones) and two surgeries… one left to go. I told them I needed it all done before my insurance expired, but the doctors couldn’t make that happen. I was admitted through the E.R. of a local hospital late in September and had Laser Lithotripsy done for two stones in my left kidney, the largest of which was 11mm. The approach was, I later learned, a “dusting” approach usually done for “softer” stones. I was informed only recently that the collections of stone fragments from that surgery were too small to collect. I suspect, however that they were either lost, discarded or unable to be collected as I understand that using a laser on a stone, even a soft one, breaks it into fragments. In any case, there is no analysis on record as to the actual composition of the stones. In late December, I had another stone attack which landed me back in the E.R. with the right kidney this time having two stones, one lodged in the ureter (5mm) and one at the entrance to the ureter in the kidney (7mm). The stone pain had subsided thanks to the miracle of modern pain relief and I was able to clear-headedly discuss the plan and options with the urologist on call. As is usual these days, the urologists are not employees of the hospital. I discussed with him the plan for treatment and together we decided to use shock wave lithotripsy which was not available in that hospital. I decided that if it was simply a matter of where I was bedded that was keeping me from the treatment that could potentially get at both stones at once (as apposed to lasering which would not allow access to both stones), then a transfer was preferable to multiple surgeries which would definitely land outside of my covered period as my insurance expired at the end of the month. My shock wave lithotripsy (SWL) was performed and a stent was put in while I was under on the last day of the month (the soonest it could be performed) as an outpatient surgery. Unfortunately, my bones were placed in such a way that the SWL could not get past my pelvic bone to access the larger stone in my kidney. I am now left with a stone at the entrance to my right kidney that hangs like the sword of Damocles. I had not received detailed information from my providers on these upcoming procedures that would allow me to ascertain costs. When I requested this information prior to undergoing each of the previous procedures I was told that it was impossible to know. So, now without the excuse of “I can’t tell you how much it costs because of insurance variability”, I demanded to know the price tags… prior to getting anything done. I have had to cancel surgeries twice in order to get the information. I am still in that process. The facilities charges are astronomical and are built around the codes that the doctors determine they will need for their surgery. Each separate code brings with it well over $1,000. So when the doctor ordered an additional code for my second operation (after I canceled the first), I started to question everything. Each facility has a specialist hidden within the phone system tree, and it is best to talk to the operator to find them. They are called Insurance Verification, Cost Evaluators, Financial Counselors, Cost Estimators, and possibly more as there seems to be no consistency in the industry. If the doctors office had already scheduled you at the facility, they will have the codes the doctor sent over. If you have not been scheduled, you must get the codes from the scheduling person for your doctor. If they haven’t decided to schedule you yet, you can ask for the codes that the doctor will be using and why each code is necessary during your visit. They will likely not know, but they can get them for you… this will likely take a willingness to be persistent. I am going back to my doctor to discuss the codes chosen and exactly why each was chosen. This will cost me a doctors visit ($125), but I think it’s worth my time and $. BTW, I found one facility that charges $2,000 less for the exact same codes… but my doctor’s office said that they don’t work at that hospital even though it is only about 6 miles away. That’s okay, because I can use another urologist in the same medical group who will, once I have squared away all of the information…. for $2k, it’s worth it. I had trouble getting prices out of the urologists office for just their work, and finally got hold of someone in billing while on site who gave me the extension of the one person (and only one person) who does pricing. They aren’t in the phone tree, so it was a bit of a bear. Funny thing was, their prices are very much in line with Medicaid pricing, so it’s not like they had anything to hide… they just made it difficult. Strangely, the codes that I was given were all procedures that could be performed individually, but not usually together (according to the cost evaluations person at one of the hospitals that I was doing the pricing). While this was probably done so that the doctor could cover their bases in case they had to switch from one kind of procedure to another without having to request the hardware from the facility, each additional code added $1,200 – $1,800 on the low side. I determined that I would need to be very specific with my doctor and get more information on why each of these codes were necessary. Since this is an ongoing journey, I have not yet spoken with my urologist regarding the necessity of these codes. 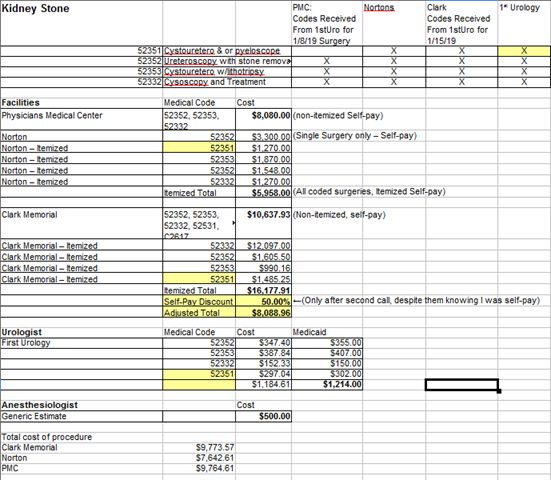 I have not found a way, yet, to get prices for anesthesiologists. I have an estimate from the scheduling nurse, but I think I will have to contact the facility, find out who works there, and then call the individual offices to get prices. 1) Get codes from doctors office… not easy, but necessary. – get itemized pricing for each code. That’s it. It makes it sound easy, but the facilities do not want to give you an itemized list and in one case quoted $2K more once the codes were listed out. That same facility then quoted me regular prices and then (when pressed) gave me a 50% discount for self pay which brought it back down to the first quoted price. I have made a list of the people I talked to at each location… none of which readily gave me a last name or a direct number to call back. Testing and diagnostics are sent from the doctors office to whoever it is easiest for them to send to… normally a large chain like Labcorp. When you ask how much a diagnostic or analysis will be the doctor’s office simply doesn’t know. When pressing for codes or numbers to order, they usually don’t have that either. I was able to get into Labcorp’s public-facing website and look up tests. This allowed me to determine the limited number of tests that it could be and then a phone call to Labcorp narrowed it further to the single test for (in this case) stone analysis. I got the CPT code from their website and I contacted a well-established lab I had run across doing my own research on kidney stones. I called them and asked for a price on that CPT code and they offered me a price of less than half the cost of Labcorp. This is where things get interesting. I called my doctors office and let them know that I wanted my stones sent to this other lab for analysis. Gave them the address and let them know that I had already made arrangements for payment to the lab so all they had to do was send it and the order for the test. A day later I got a call from my doctor’s office letting me know that they can’t do that. They have a policy to only work with Labcorp (meaning they won’t do that). In the U.S., labs are not allowed to take a sample from an individual and return it to the individual under federal law. Sending my sample out of the states to a friend overseas who then submits my sample to the lab is a valid work-around, as the federal laws no longer apply. A facility again, not on my initial calling list, was half the cost. The list is more of an assumption than a physical list that I was able to locate. “The list” was comprised of the places at which that the scheduling team at my urologists had scheduled me. I suppose I could call and ask them at which facilities they would be willing to perform surgeries or scans and I would get a pretty short list. When it came time to do X-Ray and diagnostics pricing, I first had to get the terminology from the nurse at the doctor’s office for what kind of X-ray (or CT scan) they wanted to perform. X-rays are pretty straightforward, but CT scans can be done with or without contrast. You will need to find out if it is necessary to have contrast from your Doctor’s office, and you must get an order from them. Once armed with that information, I turned to the trusty Interwebs. I did a Google search for locations that are in the metropolitan area of the closest major city (which seemed like the best bet to find stand-alone centers) that performed X-ray or radiology services. This resulted in a few places to call, and so I did. I asked to speak with someone who could get me a price on an X-ray and/or CT scan. They seemed to be a lot easier to deal with than the surgery facilities when getting this information. Thanks for being interested in my journey. I am a self-employed computer consultant who does more research than the average person, so this isn’t totally outside of my wheelhouse. What is the most difficult is wading through the reticence I receive from these businesses to give me actual pricing _before_ they do the work. I have successfully communicated to them through the analogy of having a car delivered to your house and being told that you must pay for it, but no one can tell you how much until after its delivered… and there are no returns. I hope your journeys are fruitful. Market forces simply cannot exist where there is no functioning market.